Although oil heat is widely recognized as one of the safest, and most cost-effective methods of providing heat to a home or business, failure to maintain and preserve one's fuel storage system can lead to extensive environmental damage, and costly cleanups. In fact, the average cost of cleaning up a residential oil leak can range between $20,000 and $50,000. Moreover, such cleanup expenses are frequently not entirely covered by homeowners' insurance. Unlike propane tanks, which are frequently owned by a service provider and leased to the customer, fuel oil storage tanks belong to the homeowner. That makes the homeowner solely responsible for the integrity of their own fuel storage system. Conti Oil takes the environmental risk of fuel release very seriously, and requires every customer's fuel storage system comply with all relevant state and federal regulations. Conti Oil regularly performs tank inspections and will notify homeowners if their system requires upgrades or replacements. 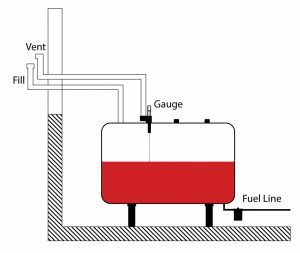 Failure to bring your fuel storage system into compliance will result in red tagging, and our drivers refusing to fill your tank. Throughout the 2016-2017 heating season, the Vermont Agency of Natural Resources has worked to complete an extensive overhaul of the State's rules and regulations regarding Aboveground Storage Tanks (ASTs). As of August 15, 2017, the regulations are law. The tank must have four legs, and be on a stable foundation (not leaning, tipping or in contact with anything but steel tank legs). The tank and tank legs must be free of any cracks, significant corrosion, pitting, rust, dents, or bulges; likewise the tank filter, valves and fittings must be free of drips, leaks and any other sign of actual or suspected spills. All buried fuel lines (connecting the tank to the heating appliance) must be installed in a plastic coating or protective sleeve, made of non-corrodible material. The tank must be equipped with a vent alarm or “whistle” that terminates outdoors, within 12 feet of the fill, and is visible from the fill pipe. The fill and vent pipes must be at least 1 ¼ inches in diameter, and terminate outside the structure. The fill pipe must have a liquid-tight cap, and the vent pipe must have a weather and insect-proof cap. Any fuel oil tank that does not meet these minimum standards will be ineligible to receive delivery, and according the to State Agency of Natural Resources, must be “red-tagged” and reported online: https://anrweb.vt.gov/DEC/ERT/RedTaggedAST.aspx. According to the new law, it is illegal for any fuel dealer to fill a “red-tagged” tank. As of August 15, 2030, all fuel oil tanks must reside on a solid concrete pad. A more detailed explanation of the rules and regulations regarding above-ground storage tanks can be found in the Aboveground Storage Tank Rule Book from the Vermont Agency of Natural Resources. Unlike above-ground storage tanks, underground fuel storage regulations are more difficult to assess because there are varying classes of underground storage tanks, each of which must follow slightly differing guidelines. We highly recommend customers with concerns about their underground storage tank call Conti Oil immediately. Full State regulations can be found in the Underground Storage Tank Rule Book from the Vermont Agency of Natural Resources. More information can be found through the Environmental Protection Agency. 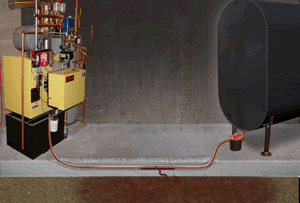 The flexible copper pipe that connects the fuel storage tank to the heating appliance is known as the "delivery line" or "fuel line". Unfortunately, fuel lines are quickly becoming one of the most common (and expensive) sources of residential fuel leaks. While modern heating systems are installed with a rubber-coated fuel line, past installations frequently left bare copper lines buried directly in a concrete foundation. Over time, the copper fuel line will react chemically with the concrete, and corrode. Such corrosion results in small fuel leaks under the foundation, which frequently go unnoticed for months or even years. Replacing the system's fuel line is both quick and cheap, and prevent hundreds of thousands of dollars in clean-ups and remediation. As of August 15, 2016 Vermont State law requires that all buried, unsleeved fuel lines be replaced. Conti Oil has the experience and expertise needed to upgrade or replace any customer's above-ground storage system. Our certified technicians will assess your tank system and provide a best course of action to quickly and affordability bring your tank up to code. Though this occasionally requires a complete replacement, quite often tanks can be brought into compliance simply by upgrading small components, such as replacing fill and vent lines, adding a vent alarm (whistle) or outdoor enclosure. For compromised and unsafe tanks, Conti Oil will deliver and install your new system, and dispose of your old tank as required by State law. For those customers that must undergo a full tank replacement, we highly recommend taking advantage of the Tank Replacement Grant Program through the Vermont Agency of Natural Resources.